In a Christian romance market dominated by the great trifecta of prairie, Western, and Amish settings (with an occasional Regency tossed in for “variety”), something different is reason to celebrate. That said, I’ve been rather ambivalent about the recent rise of WWII romance novels. I haven’t quite pinpointed my reason, although I have some theories. First, I don’t really consider WWII far enough in the past to be truly historical. Factor in the cars, planes, short skirts and authentic video footage of major events, and WWII really wasn’t that long ago. No, I’m not that old (even if I might feel like it some days), so the setting doesn’t feel contemporary either. However, I lived close enough to the events there was a constant stream of books and movies and newspaper articles about the war for pretty much my whole life. It has just always felt…near. Of course, there’s another downside to that movie footage—it’s in black-and-white. Even later movies using WWII settings were often in black-and-white to give them a more authentic feel. Whether it’s drama (Casablanca, Twelve O’Clock High) feature-length documentary drama (Longest Day) or even comedy (Francis), many of our WWII impressions come to us in black-and-white. Even the pilot episode of Hogan's Heroes is in black-and-white. Ask me to draw a mental image of a WWII soldier or event, and the picture will invariably be…black-and-white. And that just makes the whole setting feel very drab to me. 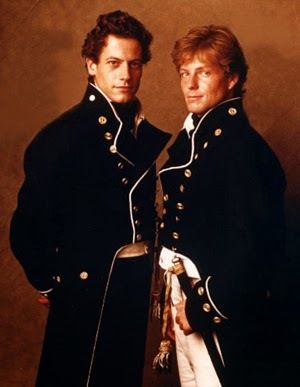 And let’s face it, the military uniforms of WWII are just not as attractive as those of the Regency era. Go ahead. Call me shallow. But you know it’s true. You're looking at the uniform, right? 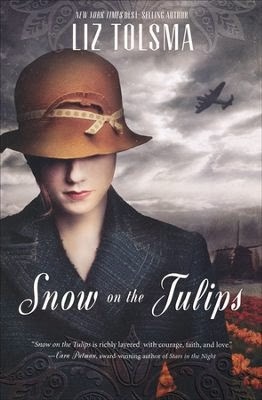 With all that said, however, when I learned about a recent novel titled Snow on the Tulips, I knew I just had to get it. For one thing, the book takes place in Friesland, and I haven’t read a Friesland setting since…never. For another, the 1945 end-of-the-war time period and Resistance hero/local girl heroine solves the problem of lengthy separations. Furthermore I had recently been reading (non-fiction) about the Hongerwinter (Hunger Winter) of 1944-1945, so the setting felt more accessible to me than it otherwise might have. Because of the unusual setting, let me begin with a short geographical background. Friesland is the northwestern-most province in the Netherlands. Though technically outside the Dutch Bible Belt (yes, there really is such a place, and it even has its own Wiki entry), it is primarily rural and has more in common with the conservative parts of the country than the anything-goes Dutch cities like Amsterdam. It’s also a little different ethnically from the other provinces. The Netherlands might be a small country, but surprisingly it has two official languages: Frisian (spoken almost exclusively in Friesland) and Dutch (spoken everywhere). After the invasion of France on D-Day, the Allied forces pushed into the southern part of the Netherlands by late 1944. However, the offensive stalled out for the winter, leaving the northern provinces under Nazi occupation for another six months. Food became so scarce that winter that approximately 22,000 Dutch died of famine during the Hongerwinter. Being rural, Friesland didn't suffer from the extreme deprivations felt elsewhere. However, as the Nazis became more desperate, their actions became even more cruel. The war is drawing to a close, but the Nazis still occupy part of the Netherlands. After the losses she’s endured, war widow Cornelia is only a shadow of the woman she once was. She fights now to protect her younger brother, Johan, who lives in hiding. When Johan brings Gerrit Laninga, a wounded Dutch Resistance member, to Cornelia’s doorstep, their lives are forever altered. Although scared of the consequences of harboring a wanted man, Cornelia’s faith won’t let her turn him out. As she nurses Gerrit back to health, she is drawn to his fierce passion and ideals, and notices a shift within herself. Gerrit’s intensity challenges her, making her want to live fully, despite the fear that constrains her. When the opportunity to join him in the Resistance presents itself, Cornelia must summon every ounce of courage imaginable. She is as terrified of loving Gerrit as she is of losing him. But as the winter landscape thaws, so too does her heart. Will she get a second chance at true love? She fears their story will end before it even begins. The book opens with a short glossary of approximately 40 Dutch, Frisian, and German words used throughout the book, and I need to add a disclaimer of sorts. Though my Dutch ancestors did not emigrate from Friesland (they came from the southwestern-most province), I grew up in a town settled by Frisians. That, combined with my years in a Dutch-background church, made many of the words already to familiar to me. I don’t think the author overuses the foreign words, but I can’t speak to the ease or difficulty others might have with the non-English words. The initiating event of this book draws inspiration from a true story of a Nazi mass execution that left one of the victims (barely) alive. Widow Corrie DeVries lives in her deceased parents’ home with her 20-year-old brother Johan. The Nazis have been conscripting all the young (and not-so-young) men, so Johan is pretty much restricted to the house (and the hidey hole under the house whenever unexpected “company” shows up). However, like young men are wont, he seeks adventure, and he goes out after dark on the night the Nazis execute members of a resistance group. That’s how he comes to discover a lone survivor who is near death. As you might guess from the book description, despite the setting of Nazi-occupied Netherlands, this is more of a slow, gentle romance than a thrilling adventure, and much of the conflict is internal. The book takes place over the course of several months, from February 1945 until the liberation of the Netherlands on May 5, 1945. Gerrit is a very injured (and wanted) man, so like Johan, he also spends a great deal of the book confined to Corrie’s house. Of course, the Nazis—realizing that they should have had one more body to bury—are looking for him, and they don’t have procedures for proper search and seizure in their legal codes. No, it’s not all slow and gentle. However, it is mostly Corrie’s story, as her character has the furthest to go. Other than a love affair gone bad earlier in the war, Gerrit is pretty secure in who he is and what he believes. Corrie knows the Nazis are bad, but she’s afraid to do anything. I felt like this was perhaps the weakest part of the book. Corrie’s parents and husband are gone, she has no children, she has strong personal reasons to dislike the Nazis and wish to see their defeat, and she has a strong faith. Her brother is 20 and though in danger from discovery by the Nazis, he is old enough to take care of himself should something happen to her. She seems like she would be a great candidate to work for the Resistance (let's face it, we all know CJ likes feisty heroines who carry guns or commit treason), but like I said, this is primarily the story of Corrie learning to love again and trust God enough to become the woman she can be. I hadn't heard of this book (or, to my shame, Friesland)--thanks for the review. The story and setting sound fascinating. And of course, the Regency uniforms are dashing. No argument from me. I should the breed of cattle called Friesian-Holstein, usually shortened to just Holstein. Those black-and-white cows that produce almost all the milk in the US? Yep, the breed was developed in Friesland. I'm glad you appreciated the, um, uniforms. I have heard of and wanted to read this book since it came out. I for one LOVE WWII stories and black-and-while movies. I don't think they're dull at all. The art direction in some of those movies was stellar, and they definitely have a particular style to them. DeAnna, I thought of Drew when I mentioned the uniform issue since his dapper suits would be similar in style. BTW, did you ever go watch Foyle's War? No, I haven't yet. Sigh. So much to catch up on. I love period clothes up to about WWII, so I can't argue with those other uniforms in the least. You're sending him off to sea? Oh, I'm sure he will look dashing and all -- but see, long separations! No, no. That won't work. If the wound isn't too bad, it will be back to the war with him. Gotta save the world from the Nazi scourge. Oh, yeah, he will have to go back to the Navy. He wouldn't have it any other way. But he'll have time to solve a mystery while he's recuperating. I'm sure of it. Suzie, I love tulips, but I don't think they'd grow well here at all. We have so much trouble with critters eating everything on the property. And I'm not sure our climate is a good one for tulips. Daffodils do well, but I think they are poisonous. I've heard tulip bulbs are edible (the people in the Netherlands ate them during the winter of 1944-45), but daffodil bulbs aren't. I knew iris bulbs were poisonous. I didn't know daffodils were. They are my favorite flower, but I'm allergic. I didn't know they had to eat tulip bulbs. That's sad.